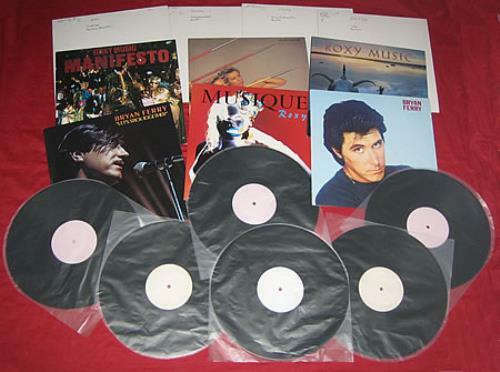 BRYAN FERRY & ROXY MUSIC Set Of 10 Test Pressings (Superb Ultra Rare 1986/87 UK EG Records set of single sided white label vinyl test pressings for eight albums, one 12" EP and one double LP. This fantastic collection comprises These Foolish Things, Another Time Another Place, Let's Stick Together & The Bride Stripped Bare by Bryan Ferry, plus Siren, Manifesto, Flesh + Blood & Avalon along with the Street Life double LP & The High Road 12" EP by Roxy Music, all housed in original picture sleevesor date stamped outer sleeves as indicated. Includes 107 tracks in total! Six of the titles are in their commercial picture sleeves - A fantastic, rare opportunity to own this unique set of test pressings!). 6. Could It Happen to Me? or visit our Roxy Music image gallery.